We will travel down the highway today to KY Downs for a card of 10 races over the hills and dales of Kentucky bluegrass. While you must have a horse that can finish, and one that doesn’t mind a few bumps and bruises along the way, the money is so good that many will take a shot. 1st: 2-4-7-11-12-10-9-8-3…I will focus on the top 3 numbers in this sequence, led by Believeinholidays (2). This 4YO gelded son of Harlan’s Holiday is coming into this one with three Top 3 finishes in a row and 4 in the last 5 outs. Nearly won as the favorite last time out, but that was at Indy Grand and the grass was washed off the turf that day. Trainer hits with .07% of those dropping into the claiming ranks for the first time, but this one gets a reunion today with a rider who knows these parts and has done well here before. I believe. Blue Lute (4) was claimed last time out, while running third for the second time in a row. This one has hit the board four times in a row, and this trainer does have 2 wins in 4 starts at this meet. Like the training session on Aug. 23. Mjoinir (7) is a 3YO son of The Factor who ran second two races back. Lost by only a nose that day in the first try over the sod at Churchill Downs. But bobbled at the start in the last out over at Ellis Park and never was able to muster much of a run. So which one will show up today. Should get some really good odds in this one, and I will use to spice up the exotics a bit. I bet the 2-7 across the board and then box the top 3 in one exacta. I key the top 3 over the rest in a much smaller version. 2nd: 12-6-10-11-2-3…I will key on the top 2 numbers in this grouping, led by a horse on the far outside — Irish Proud (12). This one nearly won the last time out up at Arlington Park in Chicago, and that was over a yielding race course. Should catch a much firmer track today, and that should help this one, too. Ran second over a firm track two back and in 20 lifetime starts, this one has compiled a 3-4-1 record to date. 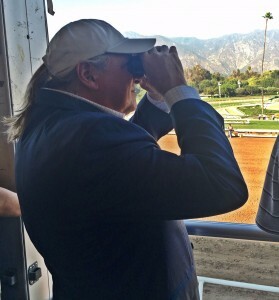 Got the blinkers back on in the last out try, and that seemed to help. Should push the pace early, and that style normally doesn’t play too well over this enduring course. But…there’s always a but, right? Not a ton of speed to burn this one up today. Should be able to make a comfortable lead, but will need to do so to preserve energy for the hill climb to the finish. Hickory Hill (6) likes to stalk the pace, and should be able to carve out a nice spot early on from this post. Winner of the last one came right back to run good again at Ellis Park. Trainer hits with .20% of those making the second start with the barn, and with .26% of those making the second start off a layup. Looks sharp in the a.m., too. Alien Season (10) goes for the barn of Wesley Ward, who does well with these types. Has been washed off the grass the last two times out, and this will be the second time off a layup. But the trainer hits with .21% of those kind, and this one has a 2-1-0 record in just 4 tries over the sod. I bet the 10-12 across the board and then box the top 3 numbers in the exacta. I key the 12-6-10 over the rest in a smaller version. 3rd: 6-7-5-1-9-8-2-12-3-11-10…This is a wide open affair going 6.5 furlongs. I will go with Foggy Kitten (6) in this spot. This is a filly going up against the colts, but that is not unusual for this trainer. Wesley Ward wins with .20% of those making the second start, and she should improve off the first race at Saratoga, when she was 6-wide in the upper stretch. Still closed to make cup a bit of ground in that one and the “show” horse in that one has already come back to win, as well. Look for improvement from this one today. Powell (7) tired late in the going to finish second on debut Aug. 4 at Laurel in the career debut. The trainer hits with .22% of those making the first grass start and with .18% of those making the first try over the sod. Has a nice work on Sept. 2 to sharpen up for this try. Was bet down for the inaugural try. Like the 6-1 ML odds being offered up here. Both Hawaiian Noises (5), and Jeggyjeggy (1) have a shot in here, as well. The former is another from the barn of Wesley Ward. This one is a first time starter for a trainer who hits with .25% of those making the debut run, and the breeding is spot on for the turf. The mare has dropped two turf winners already from 3 starters and 2 of those have gone on to become Stakes winners. The latter comes from the barn of Ingrid Mason, who hits with .15% of those making the career debut. This 2YO son of Stormy Atlantic is really training well in Chicago, and looks primed for the first start. Gets a solid grass rider in the irons. I bet the 6 -7 across the board and then box the 6-7-5 in one exacta and the 6-7-1 in another. 4th: 10-5-11-9-8-6-1-3-12-7…I will key my betting strategy on the top two in this race. Galton (10) is another who has drawn to the outside, but this 7YO gelding has been really good of late. Over the last three races, he has a win, a second and a third. In the last out, he ran only 2 lengths behind Mr. Misunderstood in the KY Down Preview Tourist. The latter came back on Labor Day to run third here in the Tourist. This one gets a nice rider switch today to one of the world’s best, and looks really good right now. Compass Zone (5) comes from the barn of Brad Cox, who is having a super 2018. He has won with .29% of his horses overall this year, and that includes 615 starters to date. This one ran 7th in the G3 Arlington Handicap in the last out, but was stepping way up in class that day. Gets back to softer company in this spot. Tigers Rule (11) could add some real value to the exotics, what with the 15-1 odds placed at ML. This one has not been on a firm turf since he ran here last September. Won easily that day. I expect a big turnaround in the recent form with a return to tighter ground. I bet the 10-11 across the board and then box the top 3 in the exacta. I key the top 3 over the 11-9-8-6-1 in a smaller version. 5th: 11-1-4-9-10-8-5-2-12…Another turf sprint event, and this one has drawn an outstanding field full of nice odds and value plays. I will go with World (11) in this spot, despite the fact that the 2YO son of Orb will be shifting over to the grass for the first time — after two straight runs over date dirt at Ellis Park. Ran third on debut before getting beat by a neck last time out. Both times he tired late, but the last race was a bit farther than today’s 6.5 furlong run. The sire is doing well with offspring on the turf, and the dam is by Smart Strike — another nice grass influence. Steve Asmussen is 1-for-1 after the first day this meet, and this one gets one of the hottest riders in the country right now in Ricardo Santana, Jr. Top choice. Temple (1) may offer some real value at 20-1 ML odds. This one will be making the career debut for a trainer who is 0-for-11 with horses running over the grass for the first time. And, the trainer only scores with .05% of horses making the career start #1. But this son of Temple City is very well bred for the turf, and he is training exceptionally well at Churchill Downs. I am going to utilize. I bet the 11-1 across the board and then box the top two in the exacta. I will key the top 2 over/under the 4-9-10 in two more. 6th: (15)-10-1-11-9-2-8-7-6-12…If the 15 draws into the race from the AE List, then I have to use. If not, I go this way: Maximus Beauty (10) will get my top billing. The 4YO daughter by Albertus Maximus, is out of an Invasor mare — who has already produced 2 turf winners from 3 starters. This filly ran second in the last start at Saratoga, when the race was washed off the turf. The two races before, though, she won at Churchill Downs. In 7 turf races to date, she has a win and 2 thirds. Deadline (1) has raced in back-to-back Stakes events, and nearly won the one two back. Will return to allowance company today, but the added distance may be an interesting twist. The dam of this one has 4 turf winners from 5 starters, so there is pedigree power. Vevina (11) will offer some value to the play if she can hit the board here, too. This daughter of More Than Ready broke her maiden in the last out over the all-weather surface at Presque Isle. Will face winners for the first time today, but I like there recent work over the grass course at Saratoga. Trainer hits with .19% of those trying winners for the first time. I bet the 10-1 across the board and then box the top 3 in the exacta. I key the 10-1 over the 11-9-2-8 in a smaller version. 7th: 10-8-2-1-7-5-12-4-3…Yet another race where I go to the far outside to look for a winner. This time it will be Armony’s Angel (10), who has been installed at 6-1 on the ML. I don’t know if she will go off at odds that high by PT, considering that she has run back-to-back seconds to start the career and she will be treated with Lasix for the first time today. One of Kentucky’s finest riders gets back in the saddle today, and he has combined with the trainer to win .22% of the last 18 starts together. My choice. Princess Causeway (8) is another 6-1 value play, but she sure looked good running second last time out and first time over the sod. The dam has 1 our winner from 4 starters and 1 Stakes winner, to date. Trainer is very solid and the son-in-law gets the call. Dangerous here. Naughty Joker (2) is a first timer for the barn of Wesley Ward. Been working lights out at Keeneland and looks primed for the debut. By Into Mischief, who is having another super year. The one to beat. I bet the 10-8 across the board and then box the top 3 numbers in one exacta. I key the top 3 over the 1-7 in another. 8th: 1-10-8-6-2-4-5…My Upset Special will come in this one with Cheeky Cherub (1). This 3YO filly by Pioneerof the Nile ran poorly last time out when bumped up to face Stakes company for the first time in the Hatoof Stakes at Arlington Park on July 7. Been on the sidelines since then, but the trainer hits with .15% of those returning off this type of layup and with .15% of all grass starters. This one will be shortening up to a sprint distance for the first time since running on the dirt at Keeneland back in April. In the first two career starts on the grass, this speedy sort ran away with nice victories. Now, the morning works look promising and a top rider gets the call. My pick. No Cacha Na (10) was claimed two starts back by one of the best trainers in the Midwest and in the U.S. Ran a solid third at Ellis Park in the first start for the barn, but now will return to the grass today. Trainer hits with an amazing .34% with horses making the second start for the barn after the purchase. Also, hits with .25% with all horses making the second start for the new operation. This one has never won over the grass before, but has not raced for this trainer before on the sod. Dangerous. Fairyland (8) will get the saddle from Wesley Ward, who excels with those competing in these grass sprints. This one tired in the last out on Aug. 20 at Saratoga, after pushing the pace early on. But had a right to tire. First quarter went in :21.4 and it was this filly’s first start in six months. Should be fitter today. I bet the 1-10 across the board and then box the top 3 numbers in one exacta. I will key the 1-10 over the 8-6-2 in another smaller version. 9th: 12-2-10-4-5-9-7-1-6-11…Old Friends Stakes…One of the most wide open races on the card today. I will focus on the top 3 numbers in my listing, led by Master Merion (12). This 4YO gelded son of Quality Road has not raced since running 12 of 30 at Royal Ascot. Before that one, he ran a tiring fourth in the G3 Hanshin at Arlington Park in May. But the former was against some of the best that the Brits have to offer and the latter was over the all-weather surface. If you go back three starts, this one won a Stakes event at Del Mar. And, before that? He won over this track in September of 2017. Looks to be working quite nicely for this event. And, I love the 8-1 ML odds. My Best Bet of the Day. Doctor Mounty (2) is 8-1 ML odds, as well, and this one just ran second in a G3 at Monmouth Park. This year, in six starts, he has posted a 1-2-1 record and has pocketed nearly $65,000. Has faced some good ones so far, and now gets one of the country’s best riders to the saddle for the first time. Beware. Parlor (10) was disappointing in the KY Downs Prevue Tourist Mile last time out. Ran fourth behind Mr. Misunderstood, but never mustered a serious run. Before that, he was beaten only a length in the G2 Wise Dan, and had a win and a second to Mr. Misunderstood in the two previous. Has run over this course twice already, with two seconds. I like him today. I bet the 12-2 across the board and then box the top 3 numbers in one exacta. I will key the top 3 over the 4-5-9-7 in a smaller version. 10th: 11-2-9-10-8-4-12…My first “single” of the day comes in the last with Coexistence (11), who will be making her first start for the barn of trainer Joe Sharp after turning in two straight seconds earlier this year for trainer Chad Brown. When moved to the grass two starts back, this one excelled. She has not lost by more than 1/2-length in either. Like the recent works, too. I bet the 11 to win/place/show and then key the 11 over/under the 2-9. I will key the 11 over (only) the 10-8-4-12.